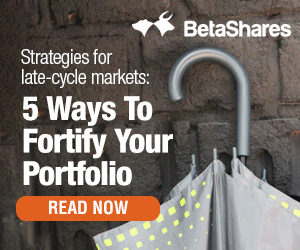 Many investors are aware of the benefits of international diversification. Unfortunately, adding global equity exposure to your portfolio also usually involve an income sacrifice, as dividend yields internationally generally tend to be lower than in Australia. As this note will demonstrate, however, it’s now possible to have your income and international diversification too, thanks to our newest ETF trading on the ASX. Australian investors who may desire some international diversification typically face the challenge of generally having to accept a lower level of income. 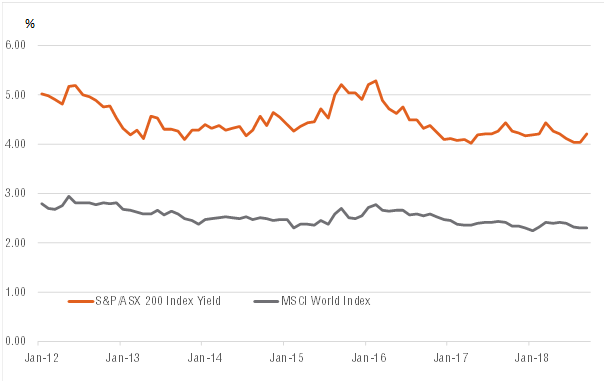 As seen in the chart below, as at end-September 2018, the dividend yield on the MSCI World Index – the benchmark global equity index – was only 2.3% compared with 4.2% for the S&P/ASX 200 Index (1). Knowing what global stocks to buy is another challenge, given the vast choice on offer and the fact that using only a simple selection criterion such as a high historic dividend yield can be problematic – as this criterion alone says nothing about the likely persistence of a company’s earnings and dividends. So what to do? 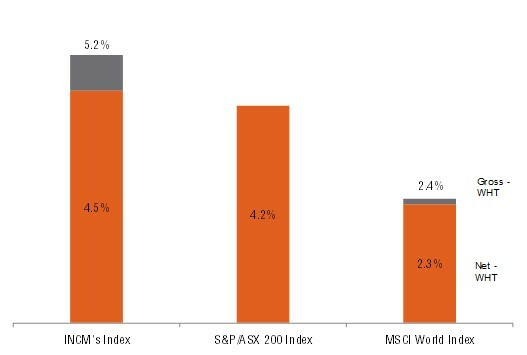 The BetaShares Global Income Leaders ETF (ASX Code: INCM) aims to meet these challenges by providing Australian investors exposure to a carefully screened portfolio of global companies with attractive income potential. The Fund seeks to achieve this aim by investing in 100 high-yielding large-cap companies across developed markets (ex Australia) that have also met a set of criteria which aim to select companies with persistent and sustainable income potential. In particular, to provide some comfort with regard to dividend persistence, companies selected must have had positive earnings over the previous year, paid regular dividends over the past three years, and maintained a dividend payout ratio over this time of not more than 80%. 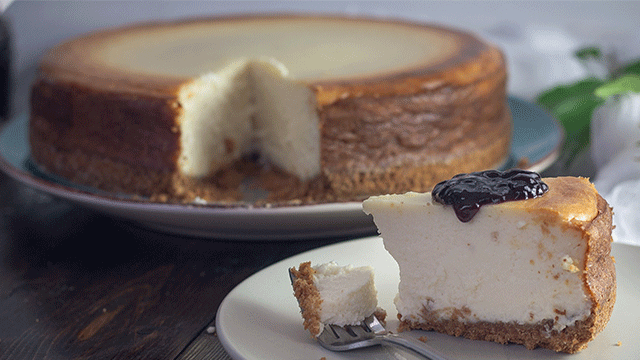 To be selected, stocks must also not exceed specified volatility thresholds. 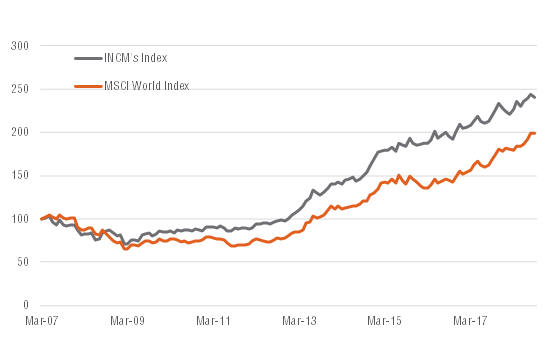 As seen in the chart below, the index which INCM aims to track has demonstrated good return performance in recent years compared to the global equity benchmark. Over the 10-year period to end-September 2018, for example, the Index which INCM aims to track delivered compound total returns of 10.8% p.a. in $A terms, compared to 9.7% p.a. for the MSCI World Index. Source: Bloomberg. Graph shows performance of INCM’s Index (the Nasdaq Global Income Leaders Index) and the MSCI World Index, not ETF performance and does not take into account ETF management costs. You cannot invest directly in an index. Past performance is not an indicator of future performance of Index or ETF. But, of course, other than the aspect of total return performance, and central to the Fund’s objective, the Index which INCM aims to track also seeks to offer an attractive dividend yield. As at 28 September 2018, the 12-month dividend yield was 5.2% p.a. (or 4.5% p.a. after taking into account withholding taxes), which compared favourably with that of the Australian market and notably higher than the global equity benchmark. Source: Bloomberg. Graph shows performance of INCM’s Index (the Nasdaq Global Income Leaders Index), not ETF performance and does not take into account ETF management costs. You cannot invest directly in an index. Past performance is not an indicator of future performance of Index or ETF. Yield will vary and may be lower at time of investment . INCM’s Index and MSCI World Index yield is shown gross and net of withholding tax (i.e. from the perspective of an Australian tax payer); S&P/ASX 200 Index Yield is net of any franking credit benefit. 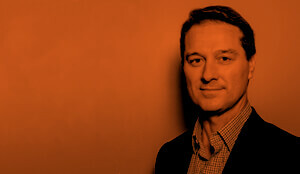 The Index which INCM aims to track also offers some diversification against holdings in the Australian market. For example, due to its income focus, INCM’s Index currently holds no resource stocks and has a notably higher weight to utilities. And although INCM’s Index has a comparatively similar weight to financials as the Australian market, these include a diverse range of global banks much less tied to the Australian property market than is the case for major banks in Australia. All up, the BetaShares Global Income Leaders ETF (ASX Code: INCM) provides an easy, transparent and cost-effective way for Australian investors to diversify away from the Australian equity market without overly sacrificing their income returns. Adding in franking credits, the gross dividend yield (i.e. including franking credits for the S&P/ASX 200 Index) was 5.6%. Yields are net of withholding tax. At the time of writing. Sector allocations and weightings may change over time.